Here's the box containing her gift... hmm, what could it possibly be...?!!! The box is a standard base and lid made out of Whisper White card stock. I decorated the lid with another piece of Whisper White, stamped with a floral design using the Greenhouse Garden stamp set and mounted on a Night of Navy panel using dimensionals. A strip of organza ribbon passes under the floral panel and ties on both sides with another strip adhered to the bottom of the box base. The floral design is stamped in blues - Tempting Turquoise, Not Quite Navy and Baja Breeze. Greenhouse Garden is a two-step stamping set, so each flower has an 'overstamp' which I added with Night of Navy ink using a stamp-a-majig. I love the depth this gives the flowers. The darker flowers are finished with a large self-adhesive pearl in their centres, while a Night of Navy marker defines the others. Here's a close-up showing how the ribbon fastens. It looks pretty but of course its main function is to hold the box closed! When the lid is taken off - you can see the gift is wrapped in tissue (I bought mine from a local market stall.) I like to seal the tissue closed with a sticker that coordinates with the design on the lid of the box. To make the sticker, I stamped the Not Quite Navy flower on an adhesive address label and cut it out with a circle punch. There's another of those self-adhesive pearls in the centre of the flower. What IS in the tissue?!!! Another feature of the box is a place to rest fingers when removing the lid. I used a 1/2" circle punch to cut semi-circles on either side of the lid to create these. This is a card I made to match the box. It was only a prototype - I felt that the double ribbon feature was a bit excessive on the card and made a much more CAS one for my friend who is a very elegant person! Sadly, I couldn't get a photo of it as I lost the light! So what IS the gift inside this box? Well, I can reveal (since the box was opened at a delightful little dinner party last Friday evening) that the gift was the gorgeous Sanded background stamp. 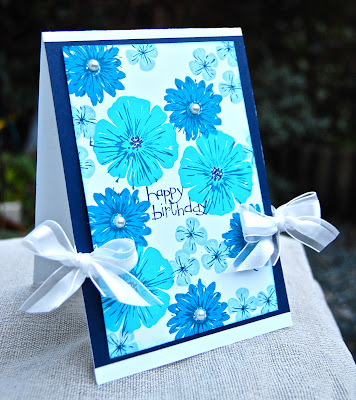 My friend is a keen stamper who makes gorgeous CAS cards with lots of individual touches. She doesn't yet have a blog but I promise I'll let you know when she does as each of her creations is a must-see! Thank you so much for spending your time here with me today. I'll be back tomorrow when I'll be showing you something I made with those Sale-a-bration poppies again. I hope you can join me! Vicky - this is absolutely gorgeous. I love the colours you've used. The box is lovely, the card is super (know what you mean about the bows!) and I'm sure your friend loves her gift!! Fab! I've never been a big fan of greenhouse garden, but this set has canged my mind! I adore the colours you've used and the pearls for that extra bit of pizzazz, very elegant! Gorgeous, gorgeous. How lovely it must be to be your friend!! I've always loved this stamp set and these gorgeous colors show off just how lovely it is. How lucky your friend is to get two gifts in one! Vicky, I thought surely that was purchased dp on your box and card. Beautiful stamping. Love the colors! Also appreciate the little details that you think of, like the half-circle finger rests and the ribbon to tie the box closed. I bet your friend was delighted with her gift! Absolutely gorgeous. Your blog is as inspiring as ever!